This interview with Lindsey Kuhn, a dog show junior handler, explains how the American Kennel Club's junior showmanship program offers young people a guided entry to the world of showing dogs. It's a training ground that teaches dog handling skills which just might propel them to Best in Show one day. For our readers who may not be familiar with the concept of Junior Showmanship, it is a special competition held within a dog show that is open only to children between the ages of nine and eighteen. In this event, each child handles their own dog for the competition, but unlike the rest of the show where the dog is being judged against its breed standard, in Juniors competition the child is actually being judged on how well they present the dog. The purpose of Junior Showmanship is to help young people learn the skills needed to show a dog competently and hopefully instill in them a love for the sport. While many children pass through Junior Showmanship, every once in a while there is one particular young handler who catches your eye, one who is clearly going to have a very bright future in the dog show world. Lindsey Kuhn is one of those exceptionally talented young handlers. Currently eighteen years old, Lindsey lives with her parents, Terry and Diane, and her five Setters in Perrysburg, Ohio. She plans to attend Bowling Green State University in the fall, but having began her dog show career at the tender age of ten, she intends to continue showing and has already won the brass ring, her first Best in Show. LoveToKnow Dogs is very pleased to have had the opportunity to speak with Lindsey about the experiences, the opportunities that her involvement in Junior Showmanship has brought her, and her plans for the future. Lindsey, how did you become interested in showing purebred dogs? I first became interested in showing dogs when I saw an Irish Setter in the park and found out it belonged to a lady my dad used to know back when he was younger and had an Irish Setter that he showed. A few days later, we went to visit that breeder, and I fell in love with a two-year-old male she had. That weekend I went to watch my first dog show, and I was hooked. I got to buy that male, and he became my first show dog. Had you received any handler training prior to entering Junior Showmanship? I had only received a small amount of training to handle a dog prior to entering Junior Showmanship for the first time. My dog was quite large and a real handful in the beginning. I was taught some of the very basics to begin, but then I routinely attended handling classes locally and learned more as time went on. Now I actually help teach those classes. Would you explain to us how Junior Showmanship classes are divided? Junior Showmanship is divided into six different classes that are based on age and experience. The classes are broken out first by age group. Junior level is for children who are between the ages of nine and under twelve years old. Intermediate level is for those young people aged twelve and under fifteen. Senior level is for those aged fifteen and under eighteen. Then within the age groups you are either in Novice or Open. Novice class is for those who don't yet have three wins in competition. Open class is where handlers advance to once they have those three wins. The Open classes usually have the more advanced handlers, with the Open Senior class being the most advanced and competitive because those Junior handlers have usually been showing for the longest amount of time and are more mature. Once a winner is picked from each of the six classes, those six handlers go back into the ring to compete for Best Junior Handler. What breeds have you shown so far, and do you have a favorite dog or breed that you prefer working with? I have currently shown over seventy-five different dog breeds. The breeds that I show the most often belong in the Sporting group, such as the Setters, Retrievers, Cockers, etc. My favorite breeds to show are Irish and English Setters since that is what I have at home. How has your involvement with Juniors affected your life? Do you feel you've learned/gained anything significant from your participation? My involvement in Juniors has had a huge impact on my life. When I was thirteen years old, I competed for the #1 Junior Handler and traveled all over the United States, meeting people and seeing places I might otherwise not have had the opportunity to. 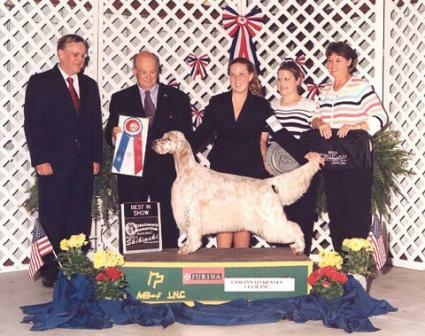 I did end up #1 Junior handler that year and won a trip to the World Dog Show in Amsterdam, Holland to represent the U.S. in the Junior Showmanship competition. In that year alone, I was able to make friends with people from many states and countries! There have been a few down sides to the experience. I am not home very much, so it makes it hard to stay in touch with friends at home. I also miss a lot of school when I travel, so I have to work really hard to get my work done when I'm gone, but I did well. I was inducted into the National Honor Society and have earned numerous scholarships, some for academics and others through my involvement in the sport of showing dogs. Tell us about that all-breed Best in Show win. Very impressive for someone so young. The All Breed Best in Show win was by far the most amazing win I have ever had. 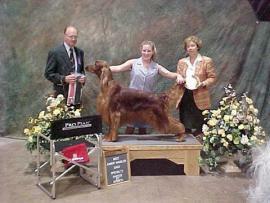 It was at the Cincinnati Kennel Club Dog Show on May 28, 2006. 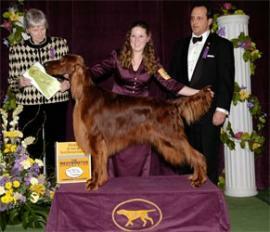 The dog who won Best in Show was an English Setter that I own and have been showing for about two years, Ch. Kaska's Isadora, owned by Lee Gancer, Carey Clark, and myself. 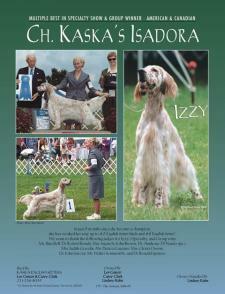 "Izzy" is four years old and is currently the number two English Setter in the country. By winning Best in Show, she defeated over 1,100 dogs on that day. Most dogs will never earn a Best in Show in their entire career, and many professional handlers won't either, so I feel very fortunate to have achieved this accomplishment before even graduating high school. So, what's next on the agenda? Will you be pursuing a career as a full-time professional handler? The next thing on the agenda is college. I will still be showing dogs while I am in school, but I will not be able to pursue a career as a full-time handler during that time. I have already co-bred my first litter and can hopefully get some more experience breeding in the near future as well. Do you have any advice for other young men and women who might be interested in learning more about Junior Showmanship? The best advice I can give to new handlers, young or old, is to go to shows, watch the professionals, and ask questions. I learned the most at dog shows by finding a professional handler I liked and watching him/her show and groom dogs of all different breeds. I always asked why they did something, not just how, so that I could learn more. I also tried to find breeders to talk to in order to find out more about my breed, how it should be presented, and how it should be groomed. Another good way to learn is to question other Juniors, especially some of the older, more experienced ones who you look up to. Your local kennel club can also be a great resource. There are just so many people out there who are willing and eager to help Junior handlers; all you really have to do is ask! Lindsey, thank you so much for taking the time to visit with us. We're sure you're going to have a very long and successful career showing dogs. Thank you for being interested in me. Although Lindsey will be limiting her showing career during school, she will be accepting a few clients. If you are interested in her handling services, you can contact her at lindz0887@aol.com.